What do we used to cut vinyl graphics and custom window lettering ? At www.vinyl-graphics-lettering we use state-of-the-art SummaSign® T-750 Cutters pictured below. SummaSign® Pro SL T-Series cutters are made for sign-makers who demand the very best in cut-quality. With genuine tangential operation, and not simply "tangential emulation," Summa T-Series plotters handle a wider range of materials and cut with unparalleled precision. Renowned quality and over 10 years of continuous internal programming advances have made SummaSign the choice of pro sign-makers the world over. 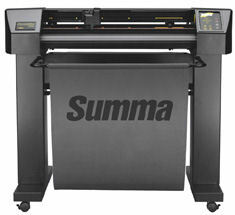 Now our new SummaSign Pro SL (Series Limited) takes vinyl cutting to a new level. We've added major advancements in communications, on-board memory and firmware. Plus new and improved OPOS™ 2.0 contour-cutting alignment system.